I ended my work day by being reminded that today was the 11th, after a fatigue-based brain fart. That gave rise to the inevitable concern from Lead Teacher, about the onset of dementia. Umm, no. I was tired, exhausted. I know tomorrow is January 12th. Now, on to the reference in this post’s title. On the podcast, this morning, one of my mentors was accenting an aversion to success, using ice cream as an analogy. If one were to go up to a counter, see a flavour of ice cream that appealed, and was asked what would be your preference, and then dithered, thinking about whether one deserved ice cream at all, even while knowing that thousands of other people enjoy ice cream, each day, what would that feel like? I have long dithered about enjoying life. I have long felt that I did not deserve success, even having a hard time accepting, initially, that Penny found me attractive. I have come to the conclusion that it was my autism talking. The fact is, she DID find me attractive. I was not the dregs with which she had to make do. So, we had our ups and downs, for 29 years, but they were years of love. I have been amazed at finding myself in places like Neah Bay, downtown Portland, San Francisco’s Russian Hill and Fisherman’s Wharf, Paris, Versailles, Utah Beach, the Dom Sector of Frankfurt, Iolani Palace, Bruges and Sitka’s Mt. Verstovia. 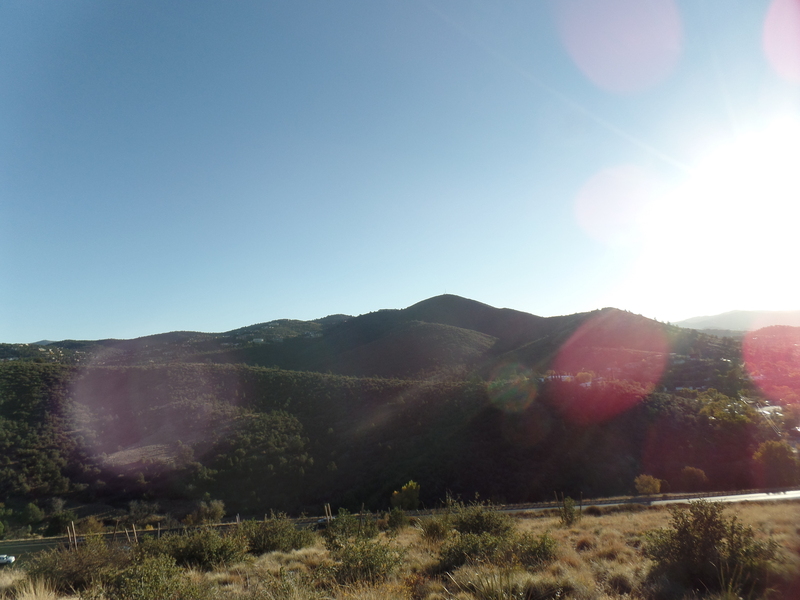 I really DID walk the length of Prescott Circle Trail and Black Canyon National Recreation Trail, albeit in sections. I am amazed, also, by the beautiful lady who now calls me friend. So, all those bowls of ice cream later, I am looking at a huge sundae, and preparing to nibble a spoonful at a time. I have spoken of giant steps being on my horizon. I still need to convince myself that I am not the family’s hood ornament, or an appendage to the two-woman team in the classroom where I work. It’s these very giant steps that will do this, for me. The mentor cautioned us to not falter. I won’t, having come all this way. I revised my Fall Break plans, a bit, so as to attend a gathering of Slow Food-Prescott, this evening. it’s been a while since I’ve connected with that group, and missing two other meetings that I attend on a regular basis is an act of triage, so to speak. So, Wednesday and Thursday will find me afield. 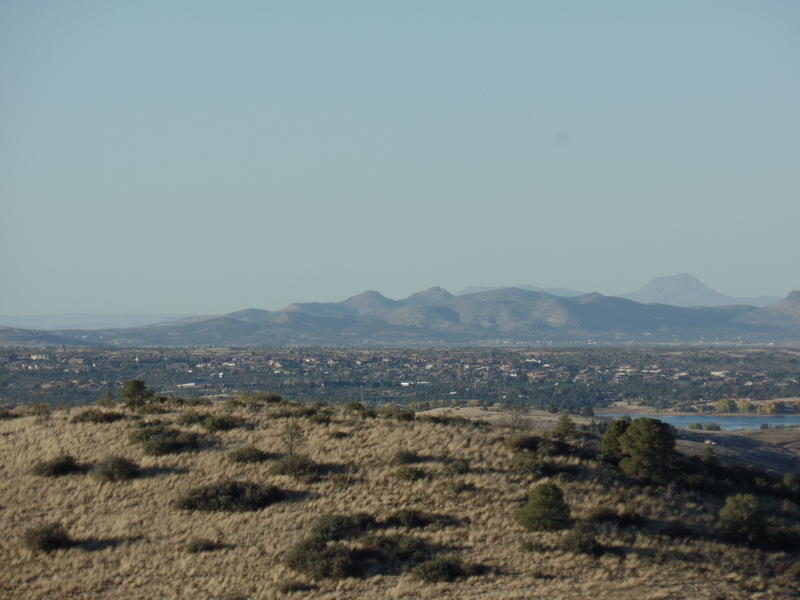 Getting back to the subject of the title, Prescott’s Wolverton Mountain lies about a mile south of Copper Basin Road, on the west side of town. I passed by it, a year ago, whilst hiking the main part of Prescott Circle Trail, intending to come back and hike the spur trail, on an odd afternoon. Sunday provided that odd afternoon. I was just about done with the post-monsoon weed pulling, in my back yard, so it was high time to get back into the woods. Up Copper Basin I went, and found the expanded parking area at Aspen Creek Trailhead. The trail towards White Spar is across the road, taking the hiker to the junction with Wolverton Mountain Trail, 3/4 of a mile southward. There is a smidgen of Fall foliage to be enjoyed, near a small rock outcropping and cave that lie along a tributary of Aspen Creek. Around a few corners and slight inclines, I located the spur trail leading to the south summit of Wolverton, after taking short bushwack to its trail-less north counterpart. The north summit offers a fine view of Granite Mountain, always an inspiration. You can see that Wolverton has been ravaged by bark beetles, in recent years. Still, there was a stand of Fall colours, nearby. The south summit proved a bit less impressive, but any mountain is worth exploring, at least once. There is what appears to be a defunct watch station and water tank, carefully fenced-off. It was a pleasant return to the trail, anyway, and the presence of a few late bloomers added to the sense of allure. There are a few more local peaks, still on my radar- Hyde Peak and Pine Mountain being the most notable, and a return to Harquahala Peak, in La Paz County, beckons sometime this winter. In the meantime, a two-day jaunt eastward will bring some treasures into view, followed by three weekends devoted to honouring the Creator and His Messengers. 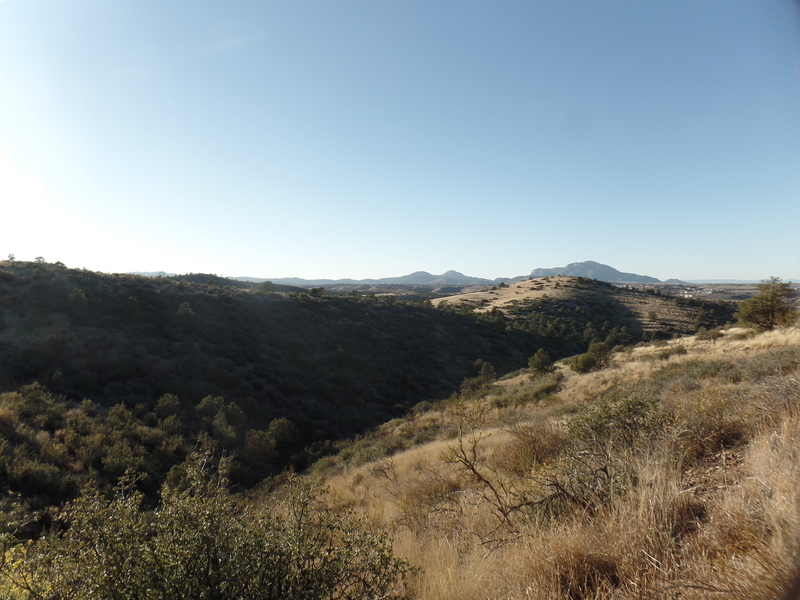 April 9, 2016, Prescott- Last Sunday, I threw in a 1-mile round trip side trail, to my Prescott Circle jaunt. Quartz Mountain is a unique promontory, in the mostly pine-clad, dry-soil terrain that is prominent in the western half of Prescott Circle. 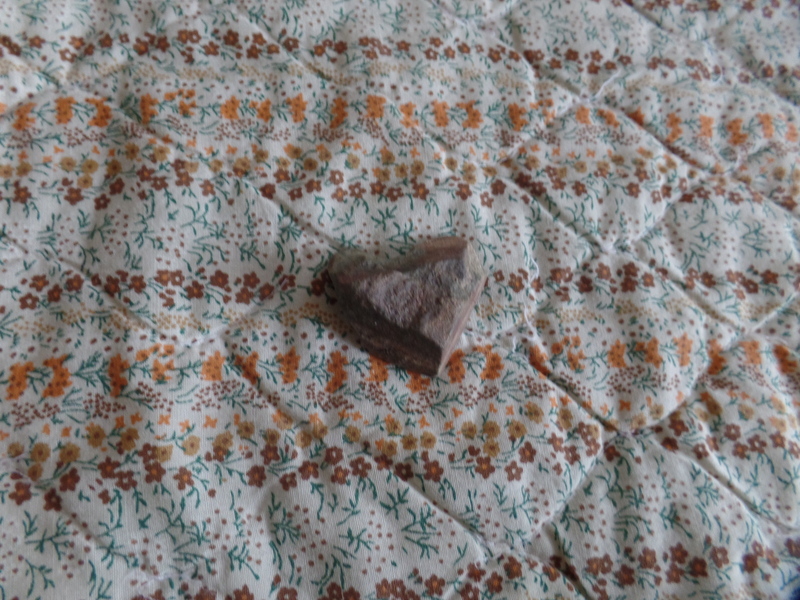 It appears to be the remnant of a volcano, which also makes sense, given that quartz is scattered from White Spar to an area just west of Thumb Butte. I had the brief company of two men and three children, who had been atop the mountain for an hour or so, studying the quartz and learning of the different colour blends. Most, as you will see, are white quartz, though there is a fair amount of pink, and some two-tone. I checked out this area, just below the summit, before heading up. The views from any point near the summit are thrilling. Now, here are several scenes of the summit. 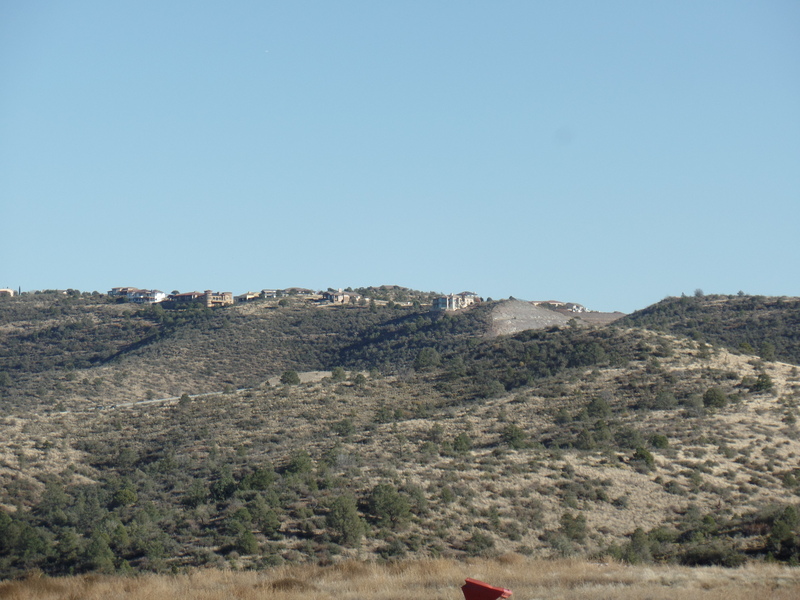 As you can see, the desert aspects of Prescott’s status as a transition zone are quite prolific, even at 6,000 feet. This little gem is one of several good reasons for side hikes, off the main Circle Trail system. As it happened, today (April 9), was a good day for Segment 3 of the Circle. It’ll be featured in the next post. April 3, 2016, Prescott- This has been a good weekend. I hiked Segment 4, of Prescott Circle Trail, in two segments, owing to two separate events, that occurred in the middle of each day. Unfortunately, the photo loading feature on my laptop has stopped working, so I will post about my hikes, once that issue is resolved. Maybe after work tomorrow, I can get some answers. The middle of the afternoon, yesterday, featured a nice performance by some friends from Chino Valley. These are long-time friends, who host a Drum Circle on the second Friday of every month, aHnd an Interfaith Devotional, on the fourth Friday. They were gracious enough to come to Prescott and present on “Peace and Love”, for an hour or so, making the brightness outside enter a spacious apartment clubhouse. The Brehmers always light up a room. Conversing with friends always makes any meal better-so discourse on matters of the spirit lifted my spirit, whether over angle food cake with berry sauce, on Thursday night, Hawaiian bento, on Saturday night, a casserole breakfast this morning, or Brunch items, this afternoon, before my second hike. One man, near our group, regaled us with his experiences in a Plains sweat lodge. Such experiences are all the more reason for each of us to get out of our comfort zones, in whatever way works best for an individual. 2010- Six years ago, spent each of my days with my blessed soul mate, in her hospital room, then in our bedroom, when not working to earn my own keep. I learned that most of those in our lives were on our side. 2011- Five years ago, said goodbye to the earthly form of my beloved, saw our son off to his adulthood, and the U.S. Navy, and learned that there was plenty of life ahead for me, on my own. 2012-Four years ago, went many places in honour of Abdu’l-Baha’s visit to North America, in 1912 and found that my heart could be at home in any number of locations. 2013-Three years ago, learned that there are subconscious attitudes and feelings that need to be brought to the surface, rooted out and swept away. No simple statement of “spiritual quest” can exorcise these. They must be acknowledged, and then sent away. Lastly, one atones. 2014-Two years ago, learned that it is not so difficult to get around on my own, even in unfamiliar places, far from here. Learned also, that amazing experiences happen daily, and that one can make gaffes, learn good lessons on one’s feet, and go on to more amazing experiences. 2015- One year ago, learned that intense connections exist between people who live a continent away, and am able to share in those connections. 2016- My roots are sinking deeper, in terms of spiritual ties to people both here, and throughout the nation and world. It is a joy to learn deeper meditation, and to trust myself to live closer to the land, both at home and while traveling. Above all, I am trusting myself more, also thanks to the meditation techniques being learned. November 14, 2015, Prescott- The nice thing about most Saturdays is that they tend to be the most open-ended day of the week. Today, for example, gave me a chance for a haircut, though not to visit the Farmer’s Market. The trade-off came with the commemoration of one of our greatest Holy Days: The anniversary of the Birth of Baha’u’llah. As I explained a day or so ago, we Baha’is now observe this Day in tandem with the anniversary of the Birth of Al-Bab. The spiritual power of these “twin” Holy Days has yet to be seen by humanity-at-large, but it is felt by me, and millions of others around the world. About twenty-five of us gathered at the home of a retired physician and a retired pharmacist. We shared the account of Baha’u’llah’s early life and several prayers, then enjoyed yet another fine Persian repast, prepared by the ladies. Among the particular delights were two types of chicken: Rosemary and marmalade. These give me two more ideas for the crock pot, this winter. Lamb meatballs were also delectable, but it would take me lots more practice to get those done right. 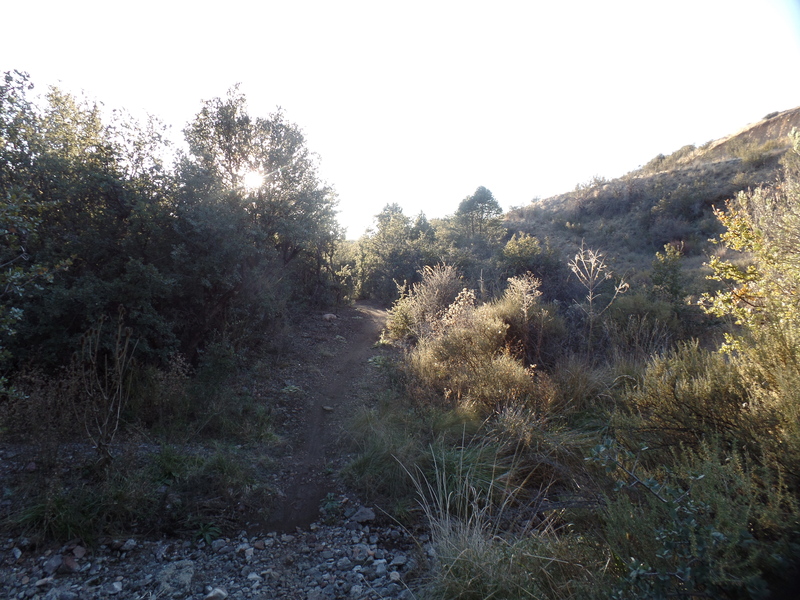 After tarrying and conversing with my fellows-in-faith, a bit longer than usual on a beautiful afternoon, I headed home, changed clothes, and course, hitting the trail on Segment 7 of Prescott Circle Trail. The northern half of this segment occupied me from 3-6:30 P.M., and takes in about 4.5 miles, between Watson Lake and State Highway 69. The area is one in which I have driven several times a week, while glancing over at the wilderness between several industrial parks and one of our major shopping plazas. Today, I got to walk that wilderness. Largely scrub oak forest and tall grass, it traverses an old city landfill, now home to a medium-sized herd of deer, and a pristine valley, looking somewhat like a bowl, carved by two creeks, over thousands of years. Here are some shots of the northern half of Segment 7. 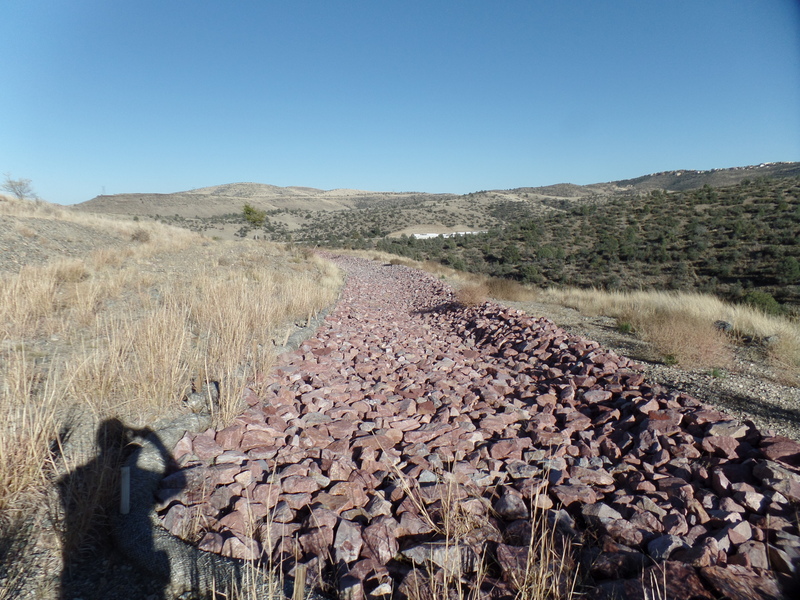 This is a southern extension of the Peavine Trail, part of the Rails-to-Trails Project. It follows an underpass at the junction with Prescott Lakes Boulevard, the connector road from northeast Prescott to State Highway 69. This scene, and the next one, are atop the former Prescott landfill, now left to area wildlife, and their admirers. This crushed rock bed serves as a drainage medium. Coming down off the landfill site, I crossed this dry wash, then went past the Yavapai County Justice Center, a juvenile court. There was no activity there, today. 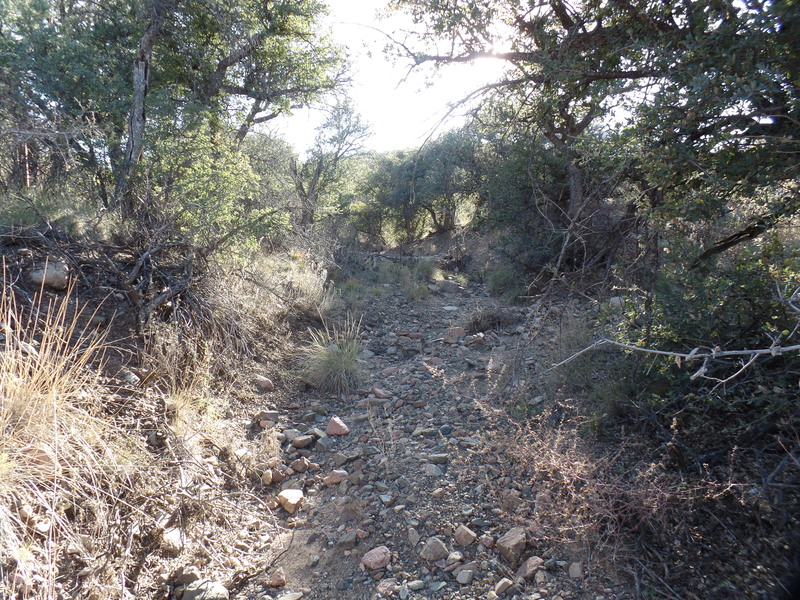 Several bicyclists shared the trail with me today, coming quickly downhill, into washes like this. This area, west of a WalMart, of all things, is as quiet and unassuming as any woodland in Prescott National Forest, some three miles further south. From the ridge above the “bowl” seen above, I had this view of the hazy hills to the west and northwest. Atop Old Bullwhacker Hill, I saw the southern half of Segment 7. 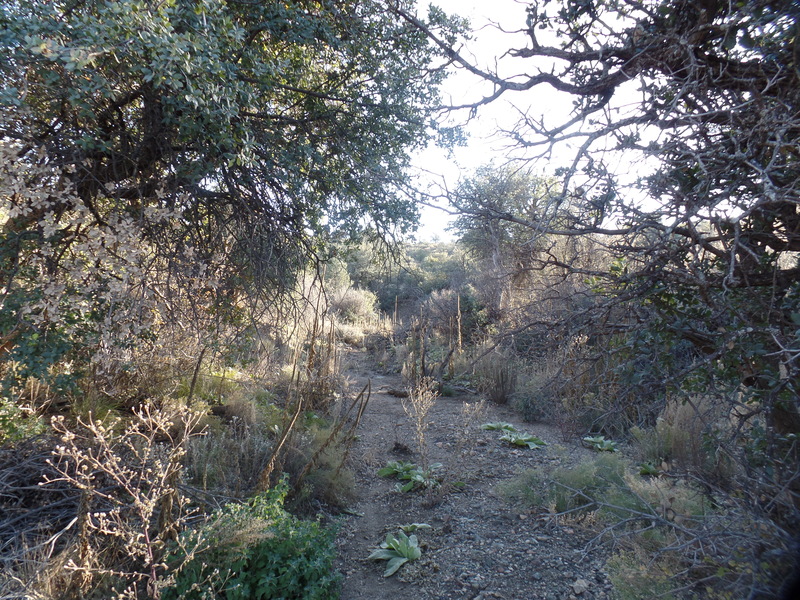 At the foot of Old Bullwhacker, I found another copse of trees and a dry creek bed, between two shopping centers. 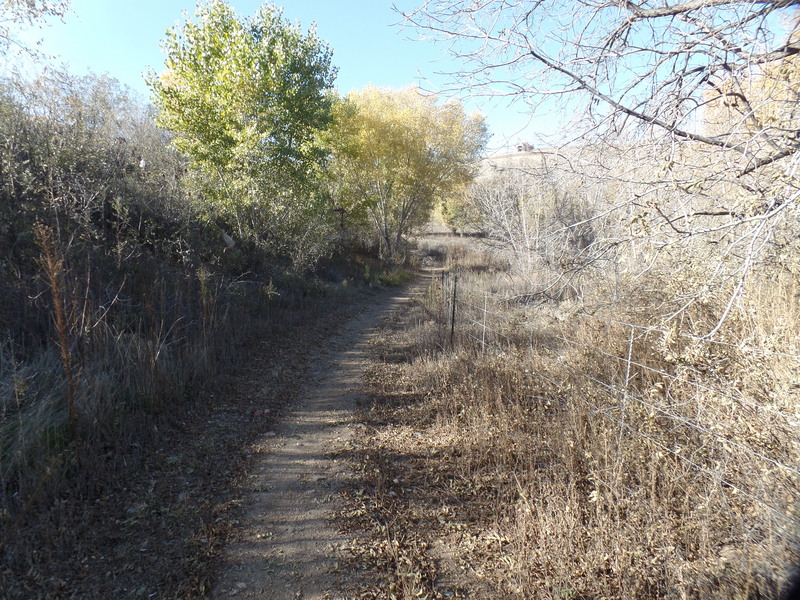 This trail leads to a culvert, through which one may pass under the busy AZ Highway 69. As I was wending my way back to the Peavine Parking Lot, I got a call from Aram, filling me in on some news from his end. After a ten-minute conversation, I looked down and saw this little affirmation, from the Universe.